Located in the Oxfordshire village of Kingham, near Chipping Norton, the Kingham Plough has achieved a happy balance between a 'proper' pub and an exceptional dining room. Since opening in 2007, Chef Proprietor Emily Watkins and her husband Miles Lampson have followed their ethos that provenance is the key to great food and they continue to source only the best local ingredients, both for the kitchen and bar. Their succes is reflected in their numerous awards. This year alone the kingham Plough has been awarded their prestigious third AA Rosette, been placed 72nd in the top 100 restaurants in the National Restaurant Awards, have won the Oxfordshire Dining Pub of the Year in the Good Pub Guide for the second year running, and continue to be recommended in the Michelin and AA guides amongst many others. In addition to the dining pub, they have six comfortable bedrooms upstairs for customers to really make the most out of their Cotswolds experience. As a family-run pub, the Kingham Plough is both child-friendly and dog-friendly, maintaining a relaxed and welcoming atmosphere that is comfortable, friendly and inclusive. It is everything that an exceptional Cotswolds dining pub with rooms should be. Executive chef Emily Watkins has put everything into building her business and career as a chef, working tirelessly to produce delicious dishes, developing her own style of modern British cuisine. Over the years Emily has featured on numerous TV productions including The Hairy Bikers, Tom Kerridge's Proper Pub Food, whilst also regulalry appearing in the local, national and international press. In 2014 Emily competed in the BBC's Great British Menu, winning with her fish course. Following this Emily was selected to cook her winning dish for war veterans at St Paul's Cathedral in a banquet commemorating the 70th anniversary of the D-Day landings, and has since returned to the show as a veteran judge for the South West Region. After the whirlwind of being heavily in the limelite as a prestigious chef, Emily Watkins and husband Miles Lampson decided it was time to invest in their business and improve their dated kitchen by introducing an energy efficient, eco friendly, erganomically designed commercial kitchen. Emily needed a company to help turn her ideas into reality, having previously worked with Target Catering Equipment, based in Gloucester, she got back in contact and asked Target's design team to work with her to transform her kitchen. The old kitchen at the Kingham Plough was poorly designed, highly unproductive and inefficient, using LPG bottled gas which produced a lot of waste heat that the ventilation system could not cope with, especially during the summer months making the kitchen unbearable at times for staff. Equipment was being left on for most of the day and not turned off because it was difficult to reignite, resulting in high utility bills. The antiquated equipment was also costing a lot to keep running through engineers's service call outs to replace failed thermocouples and to clear blocked gas jets. Multiple pots and pans were being used that required regular de-carbonising as did all the equipment, as the excessively high temperatures burned on all debris and spills to the cooking equipment and utensils. This again costing the company money. Being in a traditional Cotswold building the kitchen suffered with uneven floors and walls, causing surface finishes to deteriorate over time. These were to be made good and compliant with Health and Safety regulations, smooth, impervious and easy to keep clean. With a three phase electrical supply available Emily made the obvious decision of opting for an all electric kitchen. 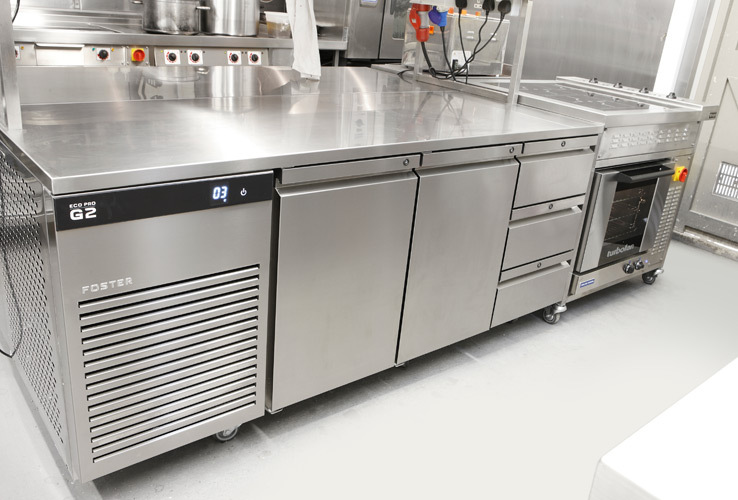 It was now down to Target to design and specify equipment that would meet her needs, which was to include an energy efficient Target bespoke commercial induction range. Target's design team and Emily looked at how they could improve work flow and productivity and create a better ambience for their kitchen brigade. The main cookline being transformed with a Target bespoke induction range able to cope with large stock pots and also small multiple pan cooking with a double plancha. Combined with a 10 grid Lincat combination oven would speed up cooking process times, reduce waste heat and minimise energy costs. Along with the main cookline range Emily decided thata bespoke island induction cooking suite would be ideal for the pastry section. This would be accessible from both sides of the kitchen and once again improve workflow. Target's design team also recommended other equipment which was specifically desgined to reduce energy consumption. 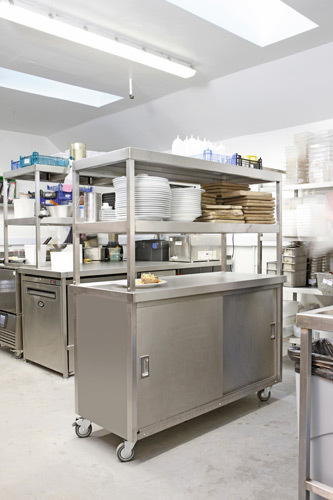 Fosters Eco range of fridges and blast chillers were specified and Target used their stainless steel fabrication facility to customise the units in order to meet Emily's demanding and site specific requirements. 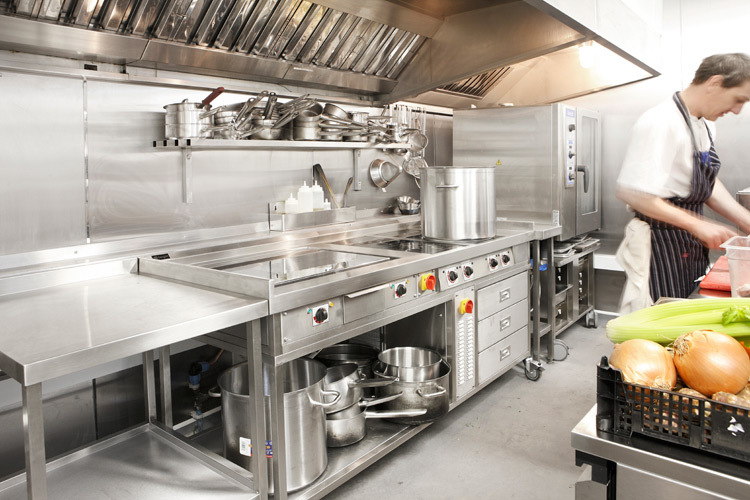 With a new hot pass, a Target fast action salamander grill, and the Winterhaulter, energy efficient heat recovery dishwashing system, despite some earlier misgivings about all the new technology being introduced into the kitchen, staff were soon enjoying the kitchen's transformation. With the complete commercial kitchen refurbishment scheduled for a 2 week turnaround, involving installation of new catering equipment, new Altro resin floors and PVC wall cladding, a new electrical distribution system, extension to the ventilation canopy along with building work to accomodate new storage areas and cold room, the Target team had their work cut out. However, with careful planning and attention to detail the refurbishment was completed 3 days ahead of scheduled handover, allowing Emily and her team plenty of time to prepare for the official re-opening just before the busy Cheltenham race week. The hard work and planning from Emily and the Target team continues to pay dividends, as the Kingham Plough has recently been awarded 2 stars by the Sustainable Restaurant Association, the kitchen is running more efficiently, energy costs are down and staff morale is up! "I chose Target because they were able to totally work with me from beginning to end, from the initial chat stages through the whole design process, creating exactly what we needed."